The Reven Ultra Cleaner offers up to seven filtration stages in one device. 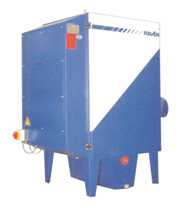 Aerosols and suspended particles are separated by the pantented RXZ-High-Performance filter system. With the help of additional filter elements smallest aerosols are agglomerated, so that a separation of smallest droplets is possible. The fan is speed-controlled, so you can controll the air flow volumes individually. The air flow volumes and the intervals between servicings are indicated by an LCD-Display. The device has a housing of solid sheet steel, free of torsions. Its base is formed as an oil- and water resistant sump. The handling can be chosen either right or left.